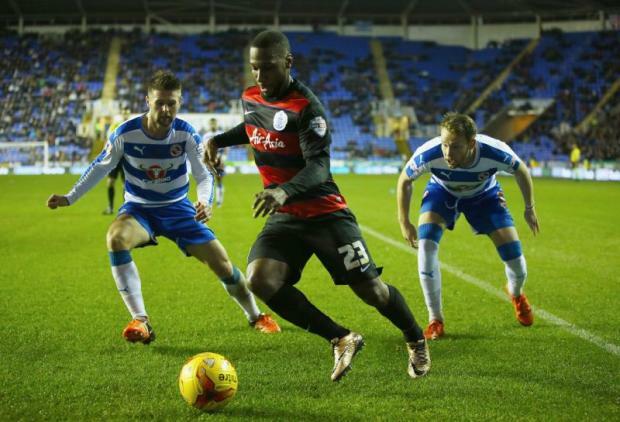 Nedum Onuoha hit a late winner to make Reading pay for profligacy in front of goal as QPR recorded a 1-0 win at the Madejski Stadium. It was most probably Neil Warnock's last game in charge of the Hoops as Jimmy Floyd Hasselbaink is expected to be named as Rangers' new manager on Friday. Warnock will hand over the reins after back-to-back victories. The hosts had chances to win the game but failed to really test Rob Green and they were made to pay when Onuoha headed home Alejandro Faurlin's corner but Royals goalkeeper Ali Al Habsi should really have done better. The win sees QPR move up to 11th place, just two points outside the play-off places, whilst Reading missed the opportunity to climb into the top-six. The first half was a quiet affair with QPR dominating the opening spell of possession but it was Reading who had the best of the chances. Rangers' best attempt came from Canadian winger Junior Hoilett after he broke through the Royals defence but he could only fire straight at keeper Al Habsi. Former Blackpool winger Matty Phillips was a consistent threat for QPR after the break, linking well with Hoilett on the wing and causing the Reading defence headaches with his direct approach. The home side had a clear chance to go ahead just before the hour mark when a corner found the head of captain Michael Hector but he couldn't keep the ball down and it sailed narrowly over the bar. And moments later the Royals came within an inch of taking the lead when a superb free-kick from Nick Blackman had Green beaten but the bal lgame back off the crossbar. And Reading's wastefulness was prove costly when QPR went ahead with just a minute left on the clock. Faurlin delivered a dangerous corner into the box and Onuoha met it at the far post with a downward header that Al-Habsi fumbled into the net. Boos echoed around the ground at the final whistle as Reading's poor run was extended to just one win in eight.